The original PW:AA game was released on the GBA in 2001 (in Japan), and Capcom released a port to the DS in 2005(in other Japan and other regions). This port featured new touch screen controls, as well as a bonus 'case' exclusive to the DS. In 2010, Capcom released a port of the game to Nintendo's WiiWare service. I won't bore you with my history with the Nintendo DS, but let's just say that there are several games from its library that I missed out on - including the Ace Attorney series. This is indeed my first experience with the oft revered Ace Attorney series...so how did it fare? 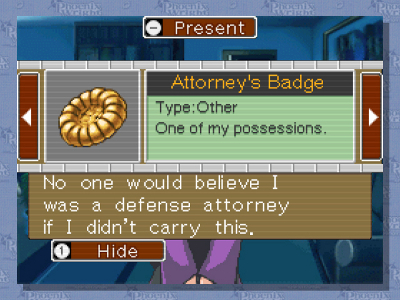 For those unfamiliar with this game, PW:AA has the player controlling Phoenix Wright, a freshly minted lawyer out to make a difference in the world. Just having passed the bar, Phoenix takes on his first case, and, well, you'll just have to see where things go from there. You'll cover murders and bribes and cover-ups galore, so just strap yourself in for the ride and enjoy the many twists and turns that await you. In Phoenix Wright's universe, the traditional court system has been abandoned in favor of a bench trial system. The crime has gotten bad enough that trials have been reduced to two attorneys going head to head over the course of three days, with the judge ruling a verdict at the end. The game is divided into four cases. Each case stands on its own, although you'll discover things about the characters that carry on from case to case. Each of those cases is divided into 'investigation' and 'trial' sections. In the investigation sections, you'll travel to various locations and examine areas in and around crime scenes. You'll talk to characters, find clues, and other information that may be crucial to solving the case. In the trial sections, you'll use this information and evidence to find contradictions in your witnesses' testimony, and hopefully break them down until they spill the beans. Gameplay wise, it's not unlike a point and click adventure game. You'll use the D-Pad to move your cursor to different areas in the locations, and Examine them. Sometimes, there won't be anything noteworthy, but sometimes, you'll find a clue, or a character will interrupt you. It helps familiarize the player with the crime and all of the different elements at play. My major complaint with these sections is that in the later cases, these sections go on for far too long. Had I not played this game with another person, I may have started to dread having to return to the various locations. The WiiWare version of this game has you using the D-Pad to navigate your locations, which I imagine is not as intuitive as simply tapping them on a touch screen. It becomes a little tedious having to backtrack through the various locations. I think it could've been more helpful if traveling was more similar to the Layton series, where you get an arrow on the edge of the screen. It's a little more visual, and that would've been helpful than the list of locations. My favorite sections of the game are the trials. It's fun to go through someone's testimony and point out their contradictions. For the most part, this is a simple process. Sometimes, figuring out a contradiction is very satisfying, as the game has you thinking outside the box. There were unfortunately a few spots in the game where I had to resort to a guide online, because it became pretty unclear as to what to do. The graphics in the game are exactly the same as they are in the DS version. I know some people complain about the pixelly nature of the images, but having been born and bred on the NES and SNES, it hasn't bothered me. The drawings are charming and have a lot of character. Would I have preferred if they used higher quality images here? I think so, yeah. However, it wasn't a deal breaker. Thankfully, many of the character's animations were just too priceless. The audio in the game is phenomenal. Character speech will often be accompanied by silly 'punching' noises and other sound effects, and add a lot of fun to the conversations. The music is great...dare I say, one of the best soundtracks the DS had to offer. The audio quality sounds a bit higher than its DS counterpart from what I've heard, so that's great to hear. I'm not sure if this game has much lasting appeal. Perhaps I will play it again at some point, but right now, every case is so burned into my memory. I'm not sure it would be as much fun if I don't have any mystery to solve. It's always good to have proof that you are licensed to do your job. In conclusion, this is a great game. It has funny dialogue, charming characters and music, and will keep you engaged. You will definitely find yourself begging for some answers to the many mysteries the game presents. It's a bit of a shame that Capcom didn't enhance the WiIWare version more. It is a straight port, through and through. The game lets you 'gesture' to present your evidence, but beyond that, there is no Wii functionality to speak of. You can't use the IR pointer to look around crime scenes, and you unfortunately do not have an option to turn off the game's animated border. The game does drag at times, notably on the third day of investigation in the last two cases. At that point, I was definitely ready to move on. If you can get around all of that, then you should definitely check this game out. As a side note, if you have someone who might enjoy playing this with you...do it. These story driven games, I've found, are very fun when played with another person. My girlfriend and I had such a great time with it, and we're now on the second game. If you're just by yourself, then you should definitely just stick with the DS version, with its touch screen controls and extra content. If you have someone to play with, however, you might get a kick out of going through the story together. +Playing the game on a big screen lets you share the fun stories with others. -The WiiWare version has received no enhancements. The low resolution artwork may turn off some people. 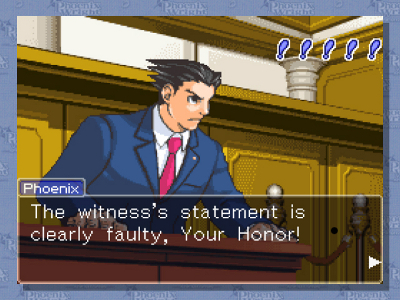 -The fifth case from the DS version is absent. You can, however...purchase it...for 100 Wii points. Of course, this would have to be 100 Wii points that you have left over from other purchases, since you can't just buy 100 Wii points. -The game tends to drag at times. -Depending on who you are, a console might not be the best way to experience this game. -The game feels a little tedious and linear at times. Sometimes, the illusion that you're exploring and investigating just isn't there. -There is no way to turn off the game's animated border. The original aspect ratio of the game is preserved, but it has a sky blue border with the PW logo floating around the background. Good review, I agree with many of the highlights of the game you pointed out. I definitely would have also liked if the controls were a bit more enhanced to compensate for the fact you're not playing on a touch screen. 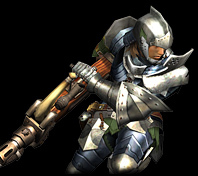 As such, some aspects of the game become a bit more cumbersome than need be. I completely agree about the enjoyment of the game with another person. My wife and I played it together, and it was really great being able to discuss the facts of each case and put our minds together to solve them. Oh yeah, and we did purchase the fifth case. I loved the story behind the case, but man, does it drag on for too long. Plus, I would argue it's not as well designed as the main story cases before it; it was the only case we had to check a guide more than once, simply because of how exact the actions and decisions it required of the players. Even the most logical of decisions wouldn't allow us to progress at times because it's not what the game is looking for. Oh, just to let you know, I'm having trouble viewing the image you embedded. You can upload it to the NW site (Forum -> File Upload), PM me if you have any questions about it. Definitely get that 5th case. It's mind blowing. If anyone is still on the fence, keep in mind that there is also the Phoenix Wright Trilogy coming out for iOS in HD. I know it was going to come out in 2012 but it had gotten delayed. That could be a very cheap option to get all three games. I'm sure it could be great on the iPad since it's basically just a tapping and reading game. @anon_mastermind This. Also it's longgggg so it definitely has the content to back up the price. Well, I've made it this far with a zero balance on my Wii points, haha. If a Retro Game Club game comes around that I want to participate in, maybe I'll wind up getting it. Hopefully at some point Nintendo lets us transfer our Wii points to the eShop if we want. This game is amazing. I'm currently playing 999 and I think I might like it even more.